The catastrophic flooding across the midwest isn’t getting much coverage on the coasts, but it is a multibillion $ disaster for multiple states and indigenous nations. Over a million wells may be contaminated. Farmers will lose their farms. The top soil is washing away. The cattle losses have yet to be tallied but are likely to be huge. 8 EPA superfund sites have been inundated and no one knows what toxic nastiness is washing into the ground and water from those sites. And of course all the little ways toxins make their way into the water from inundated septic systems, landfill sites, dumps, oil on the ground, and flooded energy infrastructure. The flood waters are washing not just soil, but decades of accumulated synthetic fertilizers and many other toxins, into the Mississippi river, all of which will eventually flow into the Gulf of Mexico. The yearly “dead zone” in the Gulf is already notorious–agriculture runoff creates algae growth, which in turn creates hypoxic zones, and all marine life in those zones dies from lack of oxygen. This year’s “dead zone” could be the largest ever. The fields have not only lost topsoil; many are now covered with sand and other debris. It will be years, decades, or more before these fields return to full production–of course, their “full production” now is based on industrial agriculture, so it’s highly unnatural, but it does feed much of this country, so it’s something to keep in mind. And of course along with those losses, many farmers will now be out of work. Once upon a time, long ago, before the rivers in this country were dammed and levied and corralled into submission, flooding like this used to bring nutrients to the prairies and regenerate the land. Once upon a time, floods like this were a temporary hardship for a long term gain in productivity for all the wild things of the vast prairies of the continent. In our modern times, flooding like this is a disaster, one that will have decades of repercussions of poisoned soil and water, poverty, and misery. 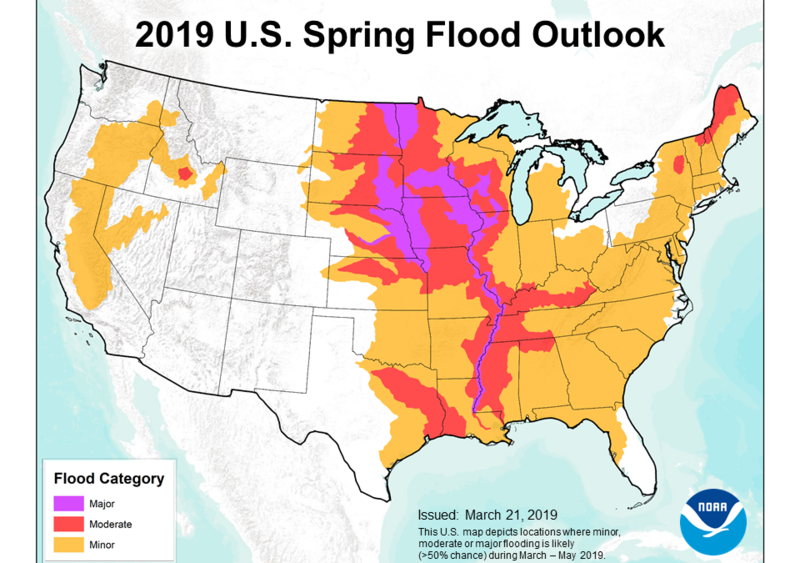 Image by NOAA of 2019 Spring Flood Outlook for the USA.